In the service sector the planning efforts often lack of effectiveness because the wrong tools are used, namely project planning software. MS Project, for example, allows you to create very detailed plans of tasks and resource allocations, which can be presented in nicely laid-out charts and tables. So it seduces any manager to embark on enormous planning efforts, resulting in detailed plans for the next weeks or even months which make quite an impression in meetings, by letting everyone know that you have thought of every little detail. Unfortunately the actual usefulness of such planning is rather limited. In fact it even might be counterproductive, because plans are subject to change. So by choosing the wrong information granularity you risk to end up with enormous replanning efforts. Or even worse, you might want to stick to your original plan in order to avoid rework. The wrong granularity is also hindering the effectiveness of planning meetings, since it lures you to lead the wrong discussions. If you show a lot of details there is a high risk that most discussions are about tasks whose content is still subject to change. On the other hand, you might forget to check if you have the correct staffing levels for the next couple of months. However, no planning doesn’t help you either, because some decisions require quite some time to be implemented so that you might get caught on the wrong foot, if you refuse to plan at all. Frequent rescheduling of machines and products has also been a problem in manufacturing. But these problems have been solved by implementing a Sales & Operations Planning (S&OP) Process. The idea behind this process is that you use the right planning granularity for the right type of decision. As a result you invest minimal planning efforts to obtain the maximum effectiveness for your decision-making process. On one extreme you could look at overall production quantities in order to decide on capacity enhancements, like building a new plant, buying new machines, or hiring new employees. On the other extreme you define the exact production sequence for each individual item for the next few hours or days, in order to allow your supplier to send parts just-in-sequence to the production line. 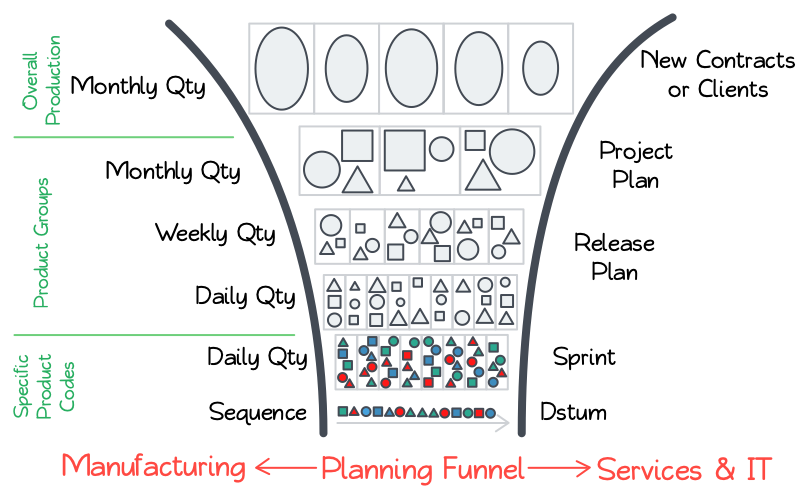 All in all, this process can be understood as a funnel which details the plan further and further as you get closer and closer to the actual production date. In Services, and especially in Lean IT, a similar process has been proven just as an effective. Instead of creating long-term MS Project files you build a similar planning funnel which helps you to take the right decision at the right time. As a result, you won’t forget to hire new people or retrain existing employees for upcoming projects. Such a funnel also helps you to figure out whether the next projects and releases will require some short-term restaffing (of a DBA for example). And finally, it allows you to control and steer the actual production, by using Sprint Meetings and Dstums. If you apply the planning principles from manufacturing to the delivery of services, you will be able to circumvent the burden of continuously updating your MS Project file without losing the possibility to make the important decisions ahead of time. However, even more productive than simplifying the planning process is a close examination of your constraints, namely the implementation lead time of your decisions. 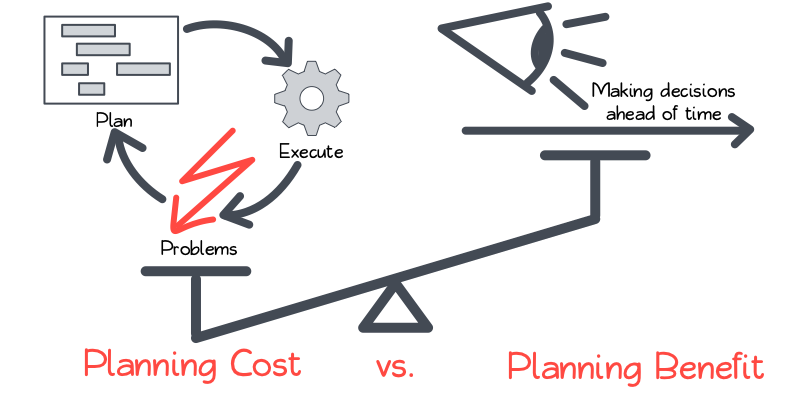 If you can reduce them, you automatically reduce planning uncertainties and planning efforts at the same time!